They’re not sure whether to be curious or cautious! Those flies must drive them nuts! 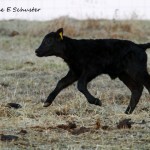 Is there a reason why that one calf doesn’t have an ear tag? 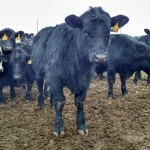 If that’s the one I’m thinking of with the short snubby ears, that was our first calf born Feb 26. We had a bad winter storm with really cold temps that week and he lost part of his ears due to frostbite. We have wind most of the time so the flies aren’t a problem. It was a rare still day when I took the video and the flies were irritating. Oh, that little one was so curious!!! Yet afraid to come TOO close, too. Reminds me so much of home. Oh the cuteness of curious calves!!! 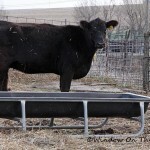 Enjoyed the video of the curious calves. They weren’t too sure about that lady with the camera. What is it? Mnmnnnnnmmmmmmm…and I liked it when there was a wide shot and a cow standing by a tree ways away! Oh, so cute!! Number 2200 was getting pretty brave there for a while! 🙂 Got a big laugh out of the mama bellowing at the end! Fun beginning to my day. Thanks! 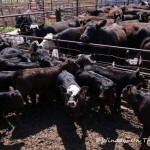 Nice-looking heifers and calves! 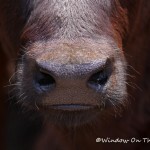 I love the head motions and facial expressions of curious calves. Your black white-face heifer with the two black-ringed eyes reminds me of our cow Proud Mary, although ours has some Brahma genetics and not by our choice. Her body stance and facial expression show some arrogance, but she will eat range cubes out of our hands. Great video! Love the white-faced ones, but all of them are so appealing, with that combination of curiosity and caution. My goodness – was the heifer bellowing at the end communicating something special, like a mama duck calling her babies? Or do they just do that for the heck of it? I loved it! So did my cat, she tried to get those calves with her paw, claws fully extended! Don’t know what she would do with it….no wonder its quiet there now the bellowing cows are gone to Summer Camp! Enjoy! You guys ok? Looked bad your way last night from here by Manhattan. We miss your posts. Hope all is well. May God bless you and keep you both. Dear Suzanne, I have missed you. Hope you and Harland are OK.